You don’t need to be a Master Mechanic to understand that steering is a pretty integral part of driving. By definition, power steering is a system that reduces the steering effort the driver needs to apply by using a power source to assist in turning the wheels. So, how do you keep your steering system operating smoothly? The steering wheel and attached shaft in the steering column. These connect to the steering gear. Along with these three major components, your power steering system may also contains a power steering pump, steering gear, linkages, bearings, drive belts, valves, seals and hoses. Yes, it’s pretty complicated stuff. If you think there’s an issue with your steering, please call us immediately. Our Master Mechanics can help. While many issues may be quick to fix, we don’t advise working on your steering system yourself. If you feel your steering is stiff, you might simply need new power steering fluid. Power steering fluid provides hydraulic pressure and lubricates your power steering system. When your power steering fluid becomes oxidized, its ability to protect components and transfer pressure is decreased. It is important that you completely flush the old fluid before replacing it. Like replacing your oil, this will ensure all contaminants are removed and that your steering system is performing at its best. Most power steering systems use a belt driven pump that provides hydraulic pressure to the system. There is a rotary-vane pump which is driven by your vehicle’s engine that creates this hydraulic pressure. If you notice any screeching or squealing noises when accelerating, you might be experiencing low belt tension, contamination or belt vibration. Inspecting your belt tension and making tensioner adjustments should part of the routine maintenance your mechanic performs on your car. Catching these issues early can save you a lot of headaches and money down the line. Another critical element of your steering system are the high and low-pressure hoses. These hoses transfer pressure from the pump to the steering gear and should be checked for signs of wear such as cracks, cuts, abrasions, stiffness, bulges, or excessive softness. dedicated front wheel and/or rear wheel drive cars should have tires replaced in pairs. Most all wheel drive vehicles require all 4 tires to be replaced as the differing tire diameters can damage all wheel drive systems. 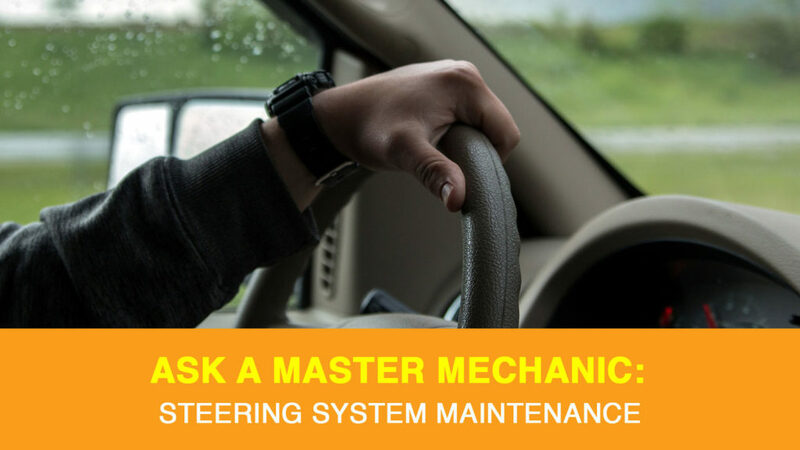 At Master Mechanic, we thoroughly inspect your steering systems and pay particular attention to the wear of your tires since this could be a sign of larger issues. Even if you feel comfortable performing maintenance yourself, we still strongly recommend consulting with a professional technician to keep everything in your steering system working properly. This isn’t a system you want to take shortcuts with. The team at your local Master Mechanic is always happy to help, so please don’t hesitate to contact us with any questions or concerns about your vehicle. We’ll get you moving in the right direction!